Buddhism is based on the wisdom of Siddhartha Gautam borne like a prince of kapilavastu situated in Lumbini, Nepal. Gautam Buddha attained illumination sitting under the tree of Pipal. This Buddhist tour will get you to the lots of significant Buddhist sites of India and we submit this tour the same as footsteps of Buddha. 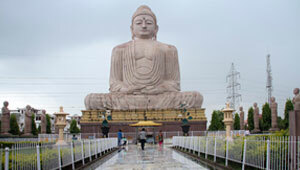 The major sites to be visiting through this tour are Bodhgaya, Patna, Kushinagar, Balrampur and Lumbini. Drive to Virndawan visit temples and after Virndawan tour back to New Delhi.